Tuesday, October 3, at 10:00 a.m., was PW’s first monthly Mary/Martha Day of the 2017/18 year. The hands-on project was making simple head covers for donating to Pink Heart Funds, which provides needed items to area women with hair loss. Sewing skills were not required.! Other monthly projects included coordinating monthly donations for Operation Christmas Child Shoeboxes, which included Small hand tools in March, Hygiene Items in April, Small Musical instruments, i.e. Harmonicas, kazoos, flutes, etc., Hygiene items in May. A drive for CASA school supplies was held in June/July. Check back for the Fall 2018 Kickoff Luncheon information. Presbyterian Women have three Circles that meet monthly for fellowship and Bible study. The Bible Study for 2018/2019 has not been announced. Visit our site closer to September for details. 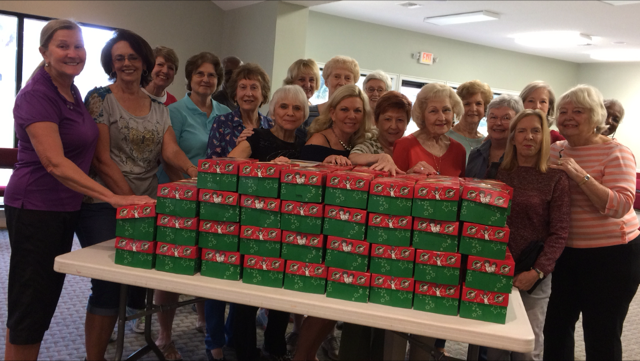 PW's Mary/Martha Day of the Operation Child shoe boxes we packed with the items donated by our church family.